Today's image is another of Harold Booth's 1934 photographs from the Fort Peck area. 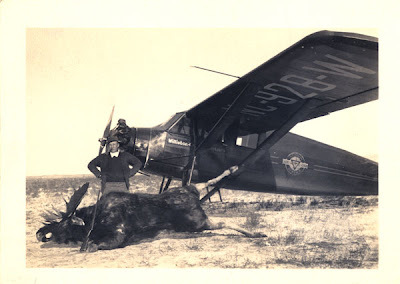 There's no caption on the photo, so all we know is that it's apparently a shot of someone who thought it was cool to shoot moose from an airplane. Judging from the logo on the side of the fuselage, the aircraft is likely an old Stinson Reliant. You can see the words "Williston" and "opportunity" painted below the plane's windows ... two terms that are seldom seen in the same sentence nowadays. The other lettering is obscured by the wing struts, but it might be the word "Crosby," which is the name of another northwest North Dakota town. 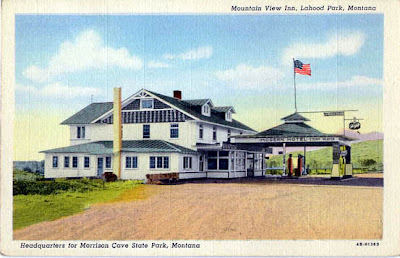 Southwestern Montana was once home to a number of wonderful old resort hotels built at the sites of naturally occurring hot springs -- places where visitors could both relax, and bathe in the supposedly-healing mineral waters. Though a few of them are still left, most have been gone for decades ... grand places like the Broadwater in Helena, and Hunter's Hot Springs east of Livingston. One of the last places in Montana to be known for its healing waters was the little town of Hot Springs, in northern Sanders County. 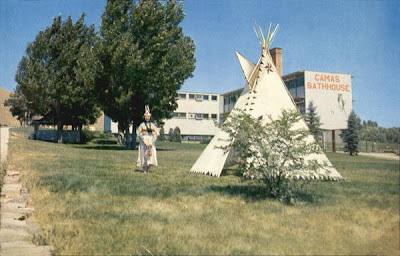 The Symes Hotel was built there in 1929-30 as a destination for bathers, but local tourism really took off after World War II, when the confederated Salish & Kootenai tribal governments built the ultra-modern Camas Hot Springs bathhouse at the edge of town. The building had separate floors for men and women, each offering a variety of mineral water and mud-bath treatments. The Camas bathhouse brought a brief boom to the town of Hot Springs, though tourism faded in the late 20th Century as the popularity of mineral-water therapy declined. The bathhouse closed in the mid-1980s and now sits abandoned, though small outdoor pools on the grounds still see some use. And the Symes Hotel remains open to serve the handful of spa pilgrims who still visit the town. Today's photo is an old postcard view of the bathhouse, probably from the 1950s or so. I don't mean to be uncharitable, but I think it's fair to say that these days Montana's university system is probably no better than average. There was a time, though, when the Missoula campus, at least, had a real reputation for intellectualism and academic endeavor, and the school was home to a series of nationally regarded scholars, particularly in the arts and letters. I was met unexpectedly by the Montana Face. What I had been expecting I do not clearly know; zest, I suppose, naivete', a ruddy and straightforward kind of vigor - perhaps even honest brutality. What I found seemed, at first glance, reticent, sullen, weary - full of self-sufficient stupidity; a little later it appeared simply inarticulate, with all the dumb pathos of what cannot declare itself: a face developed not for sociability or feeling, but for facing into the weather. 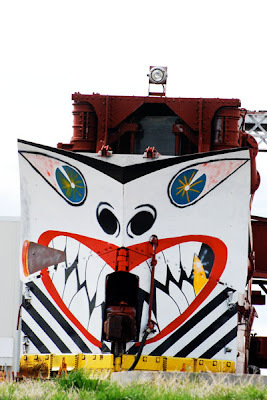 It said friendly things to be sure, and meant them; but it had no adequate physical expressions even for friendliness, and the muscles around the mouth and eyes were obviously unprepared to cope with the demands of any more complicated emotion. There's more to the essay than that, though, something that makes it a very important read for anyone who either lives in Montana or loves the place. 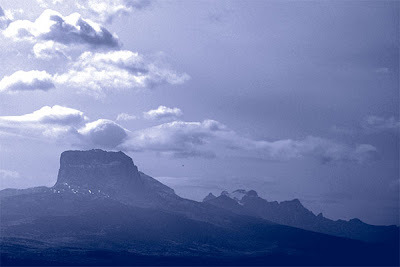 His key point is this: we as Montanans cling to myths about ourselves and our past, about our status as a last frontier ... and that doing so intellectually and emotionally holds us back. He sums it up in the his essay's final words, which I think still ring true: "[W]hen he has learned that his state is where the myth comes to die, the Montanan may find the possibilities of tragedy and poetry for which so far he has searched his life in vain." 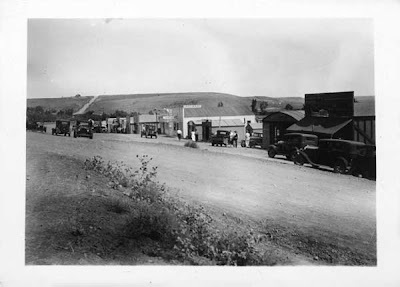 This morning's photo is an historic image of downtown Winnett, Montana, taken back in 1916. 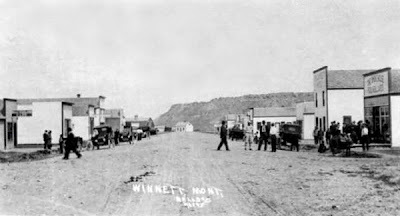 Winnett was a new homestead town back then, typical of dozens of such places all across central and eastern Montana. The place had a moment of glory, though: an oil strike at nearby Cat Creek in 1920, that briefly turned Winnett into a miniature boom town. People and equipment moved in rapidly, oil refineries were constructed, and by 1923 an estimated 2000 people called Winnett home. The town became the seat of newly-established Petroleum County in 1926. The boom faded quickly, though, and by the end of the decade it was all mostly over. 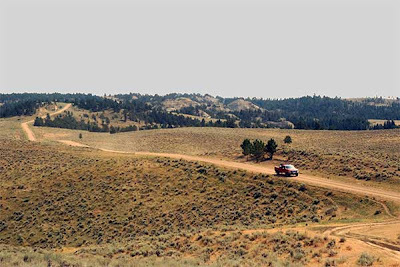 For the last 80 years Winnett has been a small and isolated ranch community ... and now Petroleum County is the least populated in all of Montana, with only 436 residents. I have a friend who's helping update one of the major travel guidebooks for Montana ... and so a while back the conversation turned to great restaurants. That's something that Montana's not known for, but every now and then the state has produced a real winner. Perhaps the most famous Montana restaurant of all was in Meaderville, an old suburb of Butte that was destroyed by the open-pit mine back in the 60s. The place in question was called the Rocky Mountain Cafe, operated by a man named Teddy Traparish, and it was THE place to eat in our part of the world. Being a Montana establishment, the speciality of course was beef -- in giant portions. The cafe had a national reputation by the 1930s, and was soon getting rave reviews from well-known celebrities. The famous journalist and What's My Line? panelist Dorothy Kilgallen reported, "No one who has never seen a Rocky Mountain steak will believe me ... but to put it as accurately as possible, my steak was the size of a Saturday night roast for a small family ... And it was the greatest steak I have ever tasted." ... two miles from Butte, in the suburb of Meaderville, is one of the best restaurants in the United States. Here, under the very shadow of the gallows frames and with the dollar slot machines making a splendid clink, coatless miners buy Lucullan meals. I don't mean to sound ungracious, however. I will never forget Mr. Teddy Traparish and his Rocky Mountain Cafe. The steaks are seven inches thick, and cover half an acre. Tragically, the Rocky Mountain Cafe closed forever in 1961, as the Anaconda bulldozers worked to tear apart Meaderville. It's one of those things that makes me believe I was born a generation too late. Today's post is the story of a cool moment, and a thoughtful gesture. A little over a week ago I was out in the hills walking my dog, when my cell phone rang. It turned out to be someone I'd never spoken to before ... a gentleman named Derek Legg, who'd come across a post I'd made a couple of months earlier about the wreck of a Great Northern Railway train at Wolf Point, back in 1934. It turned out that Mr. Legg was in possession of a series of other photographs of the wreck, shots that had been taken by a now-deceased family relative, and he very graciously offered to send the pictures to me. A fat envelope arrived at my house a few days later, containing a letter and a cache of old photos. The photos, perhaps from a Brownie No. 2 box camera, had been taken by a man named Harold Booth, who in 1934 had just graduated from the University of Iowa and had been sent to Fort Peck with the Army Reserves. 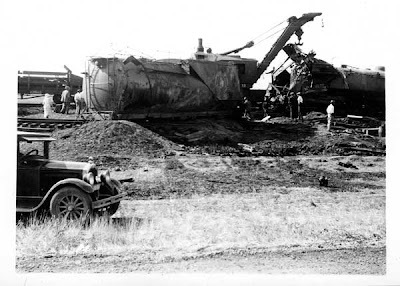 There were several photos of the Fast Mail wreck, and a whole series of other shots depicting life around the Fort Peck Dam site that summer. They're very evocative images, and I hope to feature a few of them here. Today's photo is one of Mr. Booth's shots of the Fast Mail wreck, probably taken the day after the accident. A steam wrecking crane has arrived on the scene, has righted the tender, and is now working on the locomotive. You can see how badly the locomotive cab was crushed by the event. Many, many thanks to Derek and Ann Legg for sharing these photos with us. One volume that few Montana promoters are unlikely to quote when writing about the state is called Collapse: How Societies Choose to Fail or Succeed, by the noted scientist and geographer Jared Diamond. The book is about -- well, societal collapse -- and the author uses contemporary Montana as his very first case study. I flew into Missoula airport, picked up a rental car, and began to drive south to the town of Hamilton. . . . A dozen miles south of Missoula is a long straight stretch of road where the valley floor is flat and covered with farmland, and where the snowcapped Bitterroot Mountains on the west and the Sapphire Mountains on the east rise abruptly from the valley. I was overwhelmed by the beauty and scale of it; I had never seen anything like it before. It filled me with a sense of peace, and an extraordinary perspective on my place in the universe. 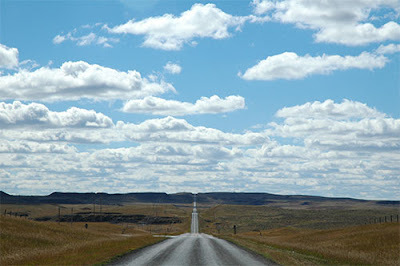 Today's road is in one of my favorite parts of Montana ... the Misouri Breaks country of northern Fergus County. And it's my favorite kind of road, too ... no freeway can compare to this. That pickup truck is heading towards one of Montana's very best backroad destinations ... the historic McClelland Ferry across the Missouri River. There'll certainly be a post or two on that later. I'm a sucker for a great business name, especially one that involves a ridiculous pun. 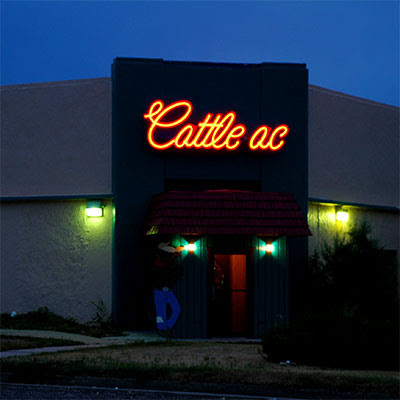 One of the best is in Miles City, Montana's self-proclaimed quintessential cowtown ... where a place called the "Cattle-ac" is a classic destination for an evening of dinner and drinks. The place was full of ranchers, listening to an Extension Agent or something talk about cattle vaccinations and such. I had a ﬁne prime rib, and enjoyed some great conversation about photography, high-plains geography, European travel, and American politics. A drink at the adjacent saloon followed, and we were the last patrons to leave. It was a great evening, all in all ... a reminder of how fun and rewarding little encounters on the road can be. 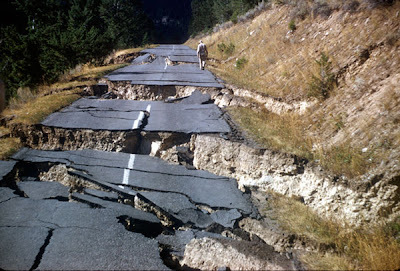 The Yellowstone earthquake of 1959 was one of Montana's greatest natural disasters, and it was also perhaps the biggest news story of mid-twentieth century Montana. Most of the reportage, of course, was both dramatic and poignant, recounting the harrowing stories of quake survivors and rescuers. Even sudden disaster can’t stop American laughter . . . even crushing catastrophe that strikes in a spilt second can’t dull the American sense of humor. A California woman, Mrs. James Pridgeon, was in the center of the Yellowstone earthquake. She stopped off in Salt Lake City Wednesday with some light side notes on the shattering quake. Mrs. Pridgeon, her husband and son were in a cabin near the Old Faithful Inn when the quake hit Monday evening. How could Russia ever defeat a people who can laugh and joke through an earthquake? Another anniversary: fifty years ago last night, at 11:37 P.M., a massive earthquake took place in the upper Madison River Canyon in far southwestern Montana. The quake killed at least 28 people, and caused one of the largest landslides in the region's recorded history. Many of the victims were campers who were buried forever by the slide, which dammed the Madison River and created Quake Lake. 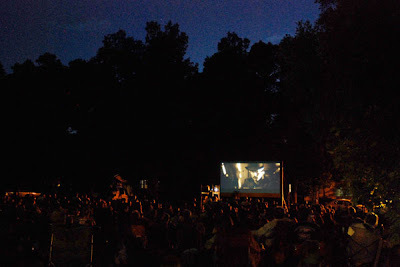 Dozens of other campers were trapped in the canyon for a terrifying night, the town of Ennis was evacuated, and the lives of thousands of others were disrupted. A number of buildings were destroyed, and Highway 287 was rendered impassible by the damage. Of the many photographs of the quake and its aftermath, I think this remains one of the most evocative. Taken for the U.S. Geological Survey not long after the quake, it shows the shredded remains of Highway 287 through the canyon. I saw this railway plow last spring, sitting on one of the turntable leads at what remains of the old Great Northern shop complex in Great Falls. Who knew that Great Falls was such an angry place? Enough of current events and southwestern Montana for a little while. 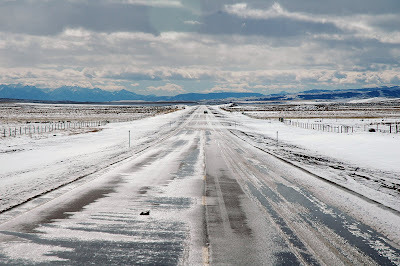 Here's a photo I took several years ago of Montana State Highway 7, heading south from the town of Baker, running straight as an arrow. 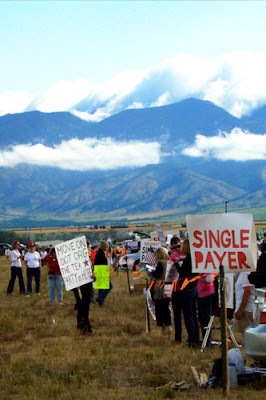 As I'm sure you all know, President Obama visited the Gallatin Valley yesterday, staging a "Town Hall" meeting out at the local airport. I'd been a little worried that our valley's cranky, far-right contingent would end up embarrassing the state, but by all accounts the afternoon went off almost without a hitch. Since the airport is nearest the town of Belgrade, most of the national news reports used that name in their datelines, finally giving Belgrade its official fifteen minutes of fame. I was amused, though, when the All Things Considered story on the event described us as being "kind of in the middle of nowhere, which a lot of things are in Montana." I was out of town for the day, but drove by the airport about four hours before the event was scheduled to start, and things were already turning into a madhouse. There were designated areas for demonstrators (far from where the president was) which were drawing huge and rambunctious crowds. Separate areas for both sides of the ongoing health-care debate, and I guess the two sides just waved their signs and yelled at each other ... until everyone was drenched by an August rainstorm. As so often happens in Montana, Mother Nature wins. This is a quick shot I took out of the car window as I was driving by yesterday morning. Here are some relatively obscure lyrics for today ... these are the final stanzas from the song "Trippin' in Montana," by an R&B songwriter named Anders Osborne. (He's a Swedish immigrant who now lives in New Orleans.) The song, inspired by Montana's perceived status as a haven for the far right, the heavily religious, and the misanthropic, was released on Osborne's 1999 album, Living Room. One more post today on the theme of loss and regret. My friend Courtney sent me the photo below after reading yesterday's post, and it's one of the more spectacular shots I've seen. It's also one of the saddest. The Red Bluff mining district is a half-hour or so west of Bozeman, not far from Norris ... and it was a big deal for a few years back in the 1860s. When the boom there ended, the largest landmark that remained was a huge stone building, constructed in 1867 as the home and office of one of the region's early entrepreneurs. 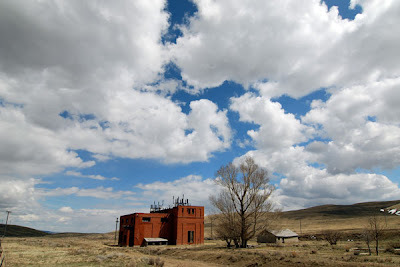 It sat there neglected for well over a century, eventually becoming part of an agricultural research facility operated by Montana State University. Some restoration work was finally done on the building a few years ago, spearheaded in part by an MSU historian named Jeff Safford who'd written a book about the region. It looked pretty good afterwards, and more and more people began recognizing the building's significance ... one of the largest and earliest buildings remaining from Montana's pioneer mining era. And then in July 2006, the building caught fire ... Courtney happened to be driving through the area and managed to photograph the tragedy. Three of the walls remained standing afterwards, but MSU had never really embraced the building for what it was, since it didn't fit in with the agricultural mission of the site. So there was never a real push to restore it. Now it's gone, and a big part of the region's history is lost ... and I suspect some of the ag guys actually breathed a quiet sigh of relief. I'm sure nearly all of you recall the series of big downtown fires we had in Montana last spring -- three blazes, each destroying a row of buildings along a city's Main Street. 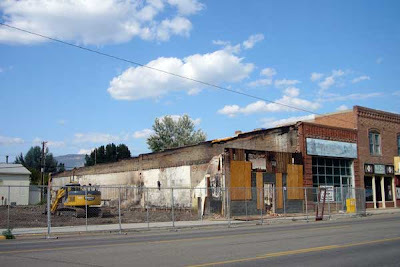 The first was in Bozeman, where an explosion nearly vaporized the old buildings; here, plans for reconstruction are already well underway. The Miles City fire also left a row of buildings very heavily damaged, and the facades were soon leveled for ostensible safety reasons ... the lots are vacant now, seriously impacting a downtown already harmed by years of fire and neglect. And that leaves Whitehall, a little Jefferson County town that already had relatively little to recommend it. Given its tiny business district, this fire caused a far greater relative impact than the other two ... but it also left the buildings far less damaged, so that if the owners or the town cared enough, they could have been rebuilt. But they apparently didn't, and when I drove by yesterday the last of the cleanup was taking place. And now Whitehall is closer than ever to not having a downtown anymore. 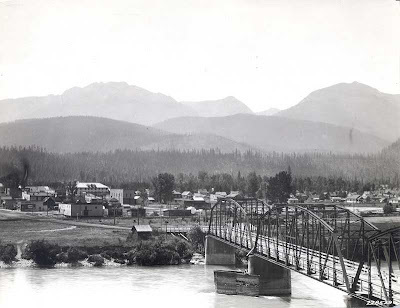 I think for many years, the part of Montana that was most neglected by historians and others was the far west, the logging country near the Idaho border along the Bitterroot, Clark Fork, and Kootenai river valleys. 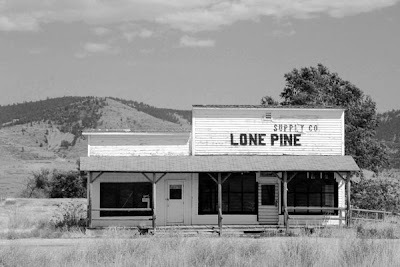 The community of Libby represents the essence of that country as well as anyplace: it's an intriguing, Twin Peaks-like little town, one that's suffered greatly in recent decades due to the corporate destruction of its lumber economy. When Libby finally garnered some broader attention over the past few years it was due to a still-greater tragedy: a massive asbestos contamination caused by a nearby mine that's sickened hundreds of local residents. This photo of Libby was taken back in 1926 for the U.S. Forest Service. The view is to the southwest, looking across the Kootenai River and towards the Cabinet Mountains. 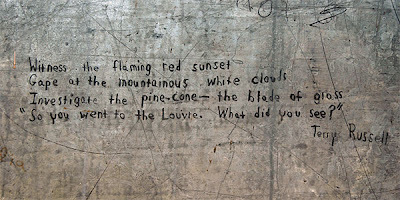 Something a little different today ... a bit of graffiti I found several years ago inside the cab of the Tripoint Lookout tower, up in the Long Pines country in eastern Carter County. It's the easternmost fire lookout in Montana, long abandoned, and a 79-step climb up to the cab. Heck of a view, too. Not unexpectedly, quotes about the evocative nature of the Montana prairies are fairly common things. Here's a paragraph from a memoir by Pearl Price Robinson called "Homestead Days In Montana," which described 1910s farm life outside of Big Sandy. It was featured in the March 1933 issue of Frontier, a wonderful quarterly journal once published by the University of Montana. We've had a series of very warm, classically-summer days here in Bozeman lately ... lots of sun, and the temperature in the 90s. But yesterday was cooler, and I felt that unmistakable tinge of early autumn -- a feeling that every Montanan senses sometime in August. So in honor of that, I thought I'd post a photo ... to acknowledge what we all know lies ahead. I shot this a couple years ago, on Highway 89 a few miles north of Wilsall. Then in correct order I recited the twelve least important things ever said about Great Falls, Montana. For the twelfth and least important thing of all, I said, "Yeah, the telephone would ring in the morning. I'd get out of bed. I didn't have to answer the telephone. That had all been taken care of, years in advance. "Fortunately it stopped one day without my having to do anything serious like grow up. We packed our stuff and left town on a bus. That was Great Falls, Montana. You say the Missouri River is still there?" "Yes, but it doesn't look like Deanna Durbin," Trout Fishing in America said. Another excuse for a Glacier photograph! As I'm sure I've mentioned, I worked as a seasonal employee in Glacier Park for a number of summers, and every three years a group of my old co-workers gets together in the park for a nostalgic weekend reunion ... always a wonderful time, and the 2009 reunion is happening this weekend. 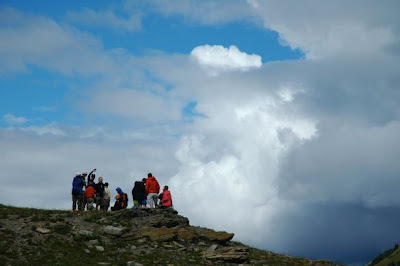 Here's my favorite shot from the last reunion back in 2006: a group of my friends stopping for lunch at Haystack saddle, on the famous Highline trail. The town of Livingston and the Paradise Valley to the south have been favored homes for well-known literary and creative folks for decades, now. That phenomenon was perhaps at its peak back in the 1970s and early 80s, highlighted by the presence of intriguing men like Richard Brautigan and Sam Peckinpah in Park County. Another person who hung out in Livingston back then was the singer Jimmy Buffet, who wrote a number of songs with definite Montana themes. Here are the opening lyrics for one called "Livingston Saturday Night," which was written for the soundtrack of an under-appreciated 1975 movie called Rancho Deluxe. Buffet re-recorded the song three years later for his album Son of a Son of a Sailor. Rockin' and a rollin' on a Livingston Saturday Night.